CTG offers high-quality LC to ST Fiber Optic Patch Jumpers designed to meet or exceed industry specifications. LC Fiber Patch Jumpers are perfect for Fast Ethernet, ATM and Gigabit Ethernet. 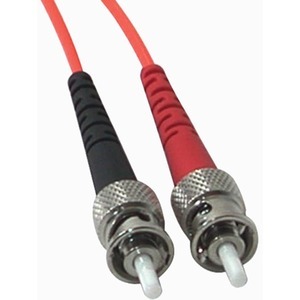 The small LC connectors satisfy the need for higher port density both in the telecom room and the work area, and offer twice the port density of traditional SC and ST fiber connectors. Fiber patch cords are used to connect fiber optic equipment to fiber optic cross-connects, interconnects, and information outlets. The LC cable with latch clip design gives each connection greater durability in resisting pulls, strains and impacts during cabling installs and maintenance. Each cable is individually 100% optically inspected and tested for insertion loss and quality.